Long Beach Police are asking for the public’s help with the investigation of the kidnapping and murder of 3-week-old Eliza De La Cruz. On Saturday, January 3, 2015, about 5:50 p.m., officers were dispatched to a shooting which occurred inside a residence in the 100 block of West 51st Street. Three adults sustained gunshot injuries and infant Eliza Delacruz was kidnapped and found deceased on January 4, 2015, in a trash dumpster in Imperial Beach, California. Over the past several weeks, Homicide detectives have canvassed the area where the shooting occurred in search of any witnesses. They also investigated the victims’ backgrounds, retraced their steps on January 3rd, and continue to review video in an attempt to identify any possible suspect(s). Detectives continue to consider all possibilities as to why these crimes may have occurred. At this point in the investigation, a connection between the victims and suspects has yet to be identified. On January 3, 2015, about 4:15 p.m., the female victim and baby Eliza exited a bus at Del Amo Boulevard and Long Beach Boulevard. As the victim, carrying baby Eliza, began to walk home, a black SUV with black rims pulled up next to her. It appeared to the victim that the driver was alone in the vehicle. The driver was described as a female African-American, approximately 40 years old, heavy set, with long dark curly black hair, wearing a pair of black designer sunglasses on her head. The driver stopped and inquired about the victim’s baby. After a brief verbal exchange, the victim walked home. Later that day, a male suspect, described as either dark skinned Hispanic or African-American, forced his way into the victim’s home, shooting three adults and kidnapping baby Eliza. Detectives contacted the bus company to review their video and retraced the bus’ route to locate any surveillance video from nearby businesses. They reviewed the bus video and determined the SUV followed the bus while the victim and baby Eliza were passengers. Although their investigation is not complete and they continue to review video, detectives are releasing three videos in hopes that anyone with information regarding the SUV or the driver will come forward. Based on the review of the surveillance video, detectives believe the SUV is a 2006 to 2011 Range Rover with large black rims. They have obtained a list of all Range Rovers in the Southern California area and are contacting owners of vehicles who match the description in an effort to identify the suspects and locate the involved vehicle. Detectives were unable to identify a license place on the SUV and have forwarded the original video to the Federal Bureau of Investigations (FBI) in Washington, D.C. for enhancement. Detectives have maintained contact with the victims, however, initial interviews and working with a sketch artist proved challenging due to the necessity of the victims’ medical treatment. 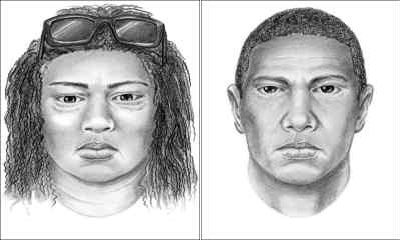 Recently, sketches of the male suspect involved in the shooting and of the female SUV driver were created. Detectives are hopeful anyone who recognizes either will come forward. The Los Angeles County Board of Supervisors established a $25,000 reward for information leading to the arrest and conviction of the person(s) involved in the death of Eliza De La Cruz. 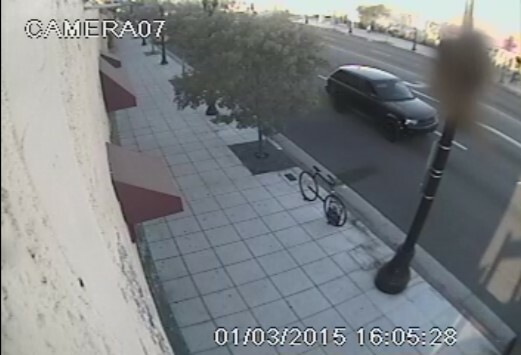 Long Beach Police urge anyone who may be able to identify the vehicle or driver who approached the victim on January 3, 2015, to call Long Beach Homicide Detectives Donald Goodman and Mark Mattia at (562) 570-7244. Anyone wishing to remain anonymous may call 1-800-222-TIPS (8477), or text TIPLA plus your tip to 274637 (CRIMES), or visit www.LACrimeStoppers.org.